"Tunicates, also known as urochordates, are members of the subphylum Tunicata or Urochordata, a group of underwater saclike filter feeders with incurrent and excurrent siphons that is classified within the phylum Chordata. While most tunicates live on the ocean floor and are commonly known as sea squirts and sea pork, others – such as salps, doliolids and pyrosomes – live above in the pelagic zone as adults." "Pyrosomes, genus Pyrosoma, are free-floating colonial tunicates that live usually in the upper layers of the open ocean in warm seas, although some may be found at greater depths. Pyrosomes are cylindrical or cone-shaped colonies made up of hundreds to thousands of individuals, known as zooids. Colonies range in size from less than one centimeter to several metres in length. They are commonly called "sea pickles." Each zooid is a few millimetres in size, but is embedded in a common gelatinous tunic that joins all of the individuals. Each zooid opens both to the inside and outside of the "tube", drawing in ocean water from the outside to its internal filtering mesh called the branchial basket, extracting the microscopic plant cells on which it feeds, and then expelling the filtered water to the inside of the cylinder of the colony. The colony is bumpy on the outside, each bump representing a single zooid, but nearly smooth, though perforated with holes for each zooid, on the inside. "Ciona is a genus of Cionidae sea squirts." "The body of Ciona is bag-like and covered by a tunic, which is a secretion of the epidermal cells. The body is attached at a permanent base located at the posterior part, and the opposite bears two openings, the buccal (oral) and atrial (cloacal) siphons. The water is drawn into the ascidian through the buccal siphon and leaves the atrium through the atrial siphon." "The development of the dorsal ganglion of the salp, Thalia democratica, is described from electron microscope reconstructions up to the stage of central neuropile formation. (iii) the development from the latter of a series of peripheral nerves. The dorsal paraxial neuropiles ultimately connect to the large central neuropile, which develops later. Direct contact between neuroblasts and muscle appears to be involved in the development of some anterior nerves. The caudal nerves responsible for innervating more distant targets in the posterior part of the body develop without such contacts, which suggests that a different patterning mechanism may be employed in this part of the neuromuscular system. The results are compared with patterns of brain organization in other chordates. Because the salp CNS is symmetrical and generally less reduced than that of ascidian larvae, it is more easily compared with the CNS of amphioxus and vertebrates. The dorsal paraxial centres in the salp resemble the dorsolateral tectal centres in amphioxus in both position and organization; the central neuropile in salps likewise resembles the translumenal system in amphioxus. The neurons themselves are similar in that many of their neurites appear to be derived from the apical surface instead of the basal surface of the cell. Such neurons, with extensively developed apical neurites, may represent a new cell type that evolved in the earliest chordates in conjunction with the formation of translumenal or intralumenal integrative centres. In comparing the salp ganglion with vertebrates, we suggest that the main core of the ganglion is most like the mes–etencephalic region of the vertebrate brain, i.e. the zone occupied by the midbrain, isthmus, and anterior hindbrain. Counterparts of more anterior regions (forebrain) and posterior ones (segmented hindbrain) appear to be absent in salps, but are found in other tunicates, suggesting that evolution has acted quite differently on the main subdivisions of the CNS in different types of tunicates." 16 papers. None stll available as PDFs. Ten relate directly to the protocordates, but only five relate directly to tunicates. They are listed below. The others are still on the Protochordates page. "Ascidian larvae use a simple set of locomotor behaviors during dispersal and settlement. The swimming performance and the ability of an ascidian larva to orient within its environment depend on the biomechanics of its rudimentary locomotor morphology. The undulatory motion of the tail generates fluid forces that propel the body with a rate and direction determined by body mass and its spatial distribution. Differences in morphology and behavior among species influence these dynamics and create differences in swimming performance. Furthermore, the ability of a larva to orient within its environment depends on its ability to coordinate the motion of its body with respect to perceived sensory cues. Research on the swimming of ascidian larvae demonstrates the biomechanical basis of tactic orientation and interspecific differences in performance in a large and diverse group of animals." "Ascidians are ideally positioned taxonomically at the base of the chordate tree to provide a point of comparison for developmental regulatory mechanisms that operate among protostomes, non-chordate deuterostomes, invertebrate chordates, and vertebrates. In this review, we propose a model for the gene regulatory network that gives rise to the ascidian notochord. The purpose of this model is not to clarify all of the interactions between molecules of this network, but to provide a working schematic of the regulatory architecture that leads to the specification of endoderm and the patterning of mesoderm in ascidian embryos. We describe a series of approaches, both computational and biological, that are currently being used, or are in development, for the study of ascidian embryo gene regulatory networks. It is our belief that the tools now available to ascidian biologists, in combination with a streamlined mode of development and small genome size, will allow for more rapid dissection of developmental gene regulatory networks than in more complex organisms such as vertebrates. It is our hope that the analysis of gene regulatory networks in ascidians can provide a basic template which will allow developmental biologists to superimpose the modifications and novelties that have arisen during deuterostome evolution." Eutely, cell lineage, and fate within the ascidian larval nervous system: determinacy or to be determined? 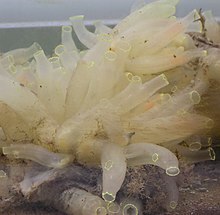 "The larval central nervous system (CNS) of the ascidian Ciona intestinalis (L., 1767) arises from an embryonic neural plate and contains sufficiently few cells, about 330, to enable definitive counts. On the basis of such counts, there is evidence both for cell constancy (eutely) in the larval CNS and for small variations in the overall numbers of cells and among defined cell types within this total. However, evidence for the range of such deviations and the existence of a true phenotypic wild type are lacking. The record of cell lineage, i.e., the mitotic ancestry of each cell, and the fates of some of these cells have recently received increased documentation in both the genus Ciona and Halocynthia roretzi (von Drasche, 1884). Relatively few generations of cells, between 10 and 14, form the entire CNS in C. intestinalis, and cell death does not occur prior to larval hatching. The tiny complement of larval CNS cells can therefore be seen as the product of a small fixed number of determinate cleavages, and variations in cell number as the product of minor deviations in this mitotic ancestry. Within these lineage records, some cell fates have already been identified, but knowledge of most is lacking because the cells lack markers or other identifying features. Nevertheless, this tiny nervous system offers the prospect that all its cells can one day be identified, and their developmental histories and larval functions analyzed, cell by cell." "Botryllid ascidians, a small but geographically widely distributed group of compound tunicates, are being used as a model system for the study of allorecognition. Botryllid ascidians possess a unique type of immunity. Pairs of colonies that meet through their extending ampullae either fuse to form a chimera or develop cytotoxic lesions at contact zones (rejection). This first tier of allorecognition is succeeded (in cases of fusion) by two additional tiers, not reviewed here (the colony resorption phenomenon and the phenomenon of somatic and germ cell parasitism). Fusion and rejection are controlled by a single highly polymorphic gene locus termed the fusibility/histocompatibility (Fu/HC) locus. One shared allele on the Fu/HC locus is enough for fusion. Rejecting colonies do not share any Fu/HC alleles. To date, 14 botryllid ascidians have been studied for their fusibility patterns; of these, the cosmopolitan species Botryllus schlosseri (Pallas, 1766) has emerged as the most studied taxon. This review summarizes studies revealing the various types of noncompatible responses that are expressed following the application of the "colony allorecognition assay" and the "cut surface assay". These include divergent alloresponses related to different populations of the same botryllid species, distinctive allorecognition sites, polymorphism and a repertoire of Fu/HC alleles, a state of low responsiveness as opposed to the expected immunological memory, the retreat growth phenomenon, and the irreversible nature of the rejection process. A detailed description of the accumulated knowledge on the effector cells (morula cells and macrophages), the humoral and cellular molecules (at the biochemical and molecular levels), and the prophenoloxidase system is given. Links between allogeneic responses and the evolutionary ecology of botryllid ascidians are revealed. Since tunicates occupy a key phylogenetic position in the origin of the vertebrates, the study of colony allorecognition in this group may shed light on self/nonself recognition elements in other multicellular organisms, including vertebrates." "This review covers 25 years of progress on structural, functional, and developmental neurobiology of adult tunicates. The focus is on ascidians rather than pelagic species. The ascidian brain and peripheral nervous system are considered from the point of view of ultrastructure, neurotransmitters, regulatory peptides, and electrical activity. Sensory reception and effector control are stressed. Discussion of the dorsal strand plexus centres on its relationship with photoreceptors, the presence in it of gonadotropin-releasing hormone and its role in reproductive control. In addition to hydrodynamic sense organs based on primary sensory neurons (cupular organs), ascidians are now known to have coronal sense organs based on axonless hair cells resembling those of the vertebrate acustico-lateralis system. The peripheral nervous system is remarkable in that the motor neuron terminals are apparently interconnected synaptically, providing the equivalent of a nerve net. Development of the neural complex in ascidians is reviewed, highlighting recent embryological and molecular evidence for stomodeal, neurohypophyseal, and atrial placodes. The nervous system forms similarly during embryogenesis in the oozooid and blastogenesis in colonial forms. The regeneration of the brain in Ciona intestinalis (L., 1767) is discussed in relation to normal neurogenesis. Finally, the viviparous development of salps is considered, where recent work traces the early development of the brain, outgrowth of nerve roots, and the targetting of motor nerves to the appropriate muscles."